The distinctive plumage of the northern flicker makes it easy to identify. The majority of its brown or brownish-grey plumage is covered in black spots, bars, and scallop patterns. It has a bold white rump patch that is visible in flight. At 28-31 cm long it is one of the largest woodpeckers found on the Central Coast. The species is split into two distinct groups: yellow-shafted and red-shafted, which have slight colour differences and are mostly found in distinct ranges. 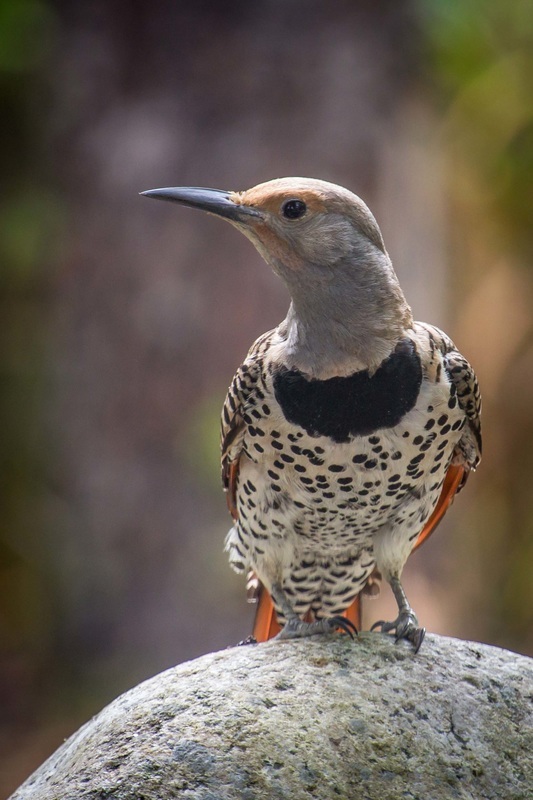 Northern flickers in the far north and east of the range tend to be yellow-shafted, and those in the west, including the Central Coast, are red-shafted. The latter individuals have a brown crown and grey face, with a red "moustache stripe" extending from the large, slightly curved bill. The "red-shafted" and "yellow-shafted" variants are named for the undersides of their wings and tails, which are tinged orange-red or yellow, respectively. Hybrids between red-shafted and yellow-shafted birds are possible, particularly where the ranges of the two groups meet. 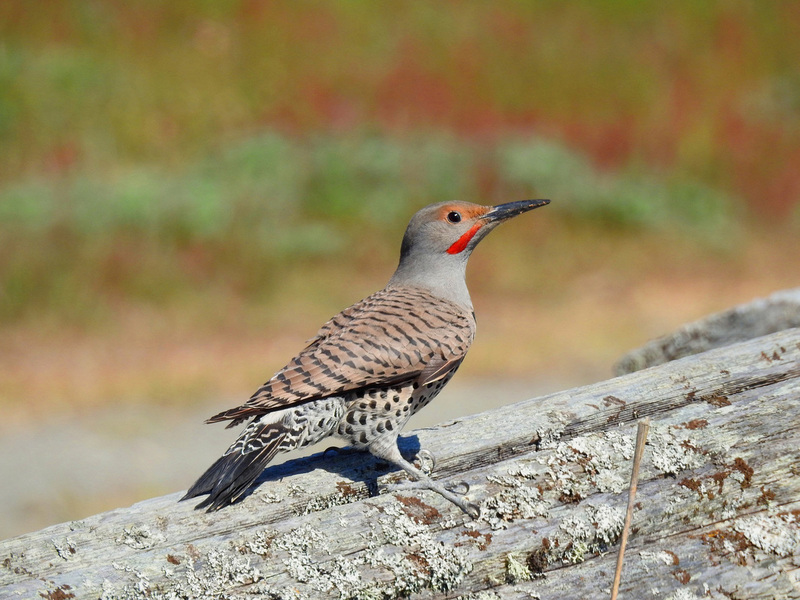 The northern flicker inhabits open areas with nearby trees, such as forest edges, meadows, parks, and backyards. While it is usually found at low elevations, it also inhabits mountain forests in western regions of its range. It eats mostly ants and beetles, and so may be seen foraging on the ground as well as in trees. It tends to make its own nest, usually in dead or diseased trees, instead of taking over previously excavated tree holes. This species is present throughout the year on the British Columbia coast. Its year-round range also extends into southern areas of Canada's western provinces, as well as most of the United States. Its summer breeding range extends across much of eastern, central, and northwestern Canada, while its winter range includes parts of the southern US and Mexico. The below video shows a hybrid northern flicker feeding. More videos and photos can be seen on the northern flicker ARKive page. A few woodpecker species found elsewhere in North America have similar colouring, including the red-bellied woodpecker and gilded flicker, but none of these species are found on the BC coast. Most occur only in the southern US and Central America. 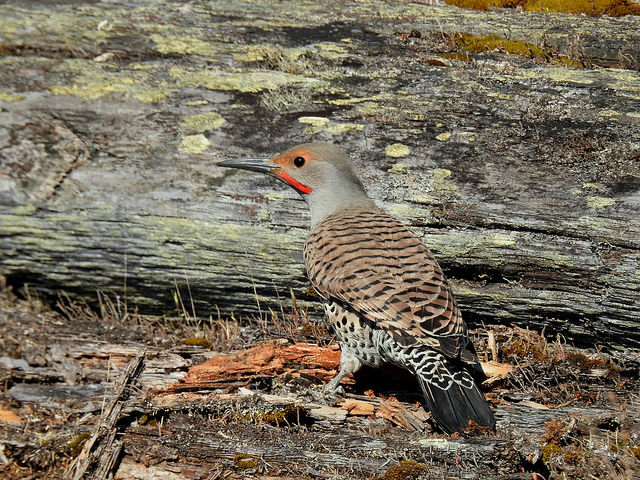 Like other woodpeckers, the northern flicker drums on objects as a means of communication. This technique is used for both mating and territory defense. A territorial bird will also engage competitors in bill "fencing duels." Northern flicker pairs mate for life, and defense displays like these fencing duels help to reinforce pair-bonds. Dunn, J. L. and Alderfer, J. (Eds.). (1999). National Geographic Field Guide to the Birds of North America. (3rd Ed.). Washington, D.C.: National Geographic Society. Pp. 276-277. Northern flicker. The Birds of North America Online (A. Poole, Ed.). Ithaca: Cornell Lab of Ornithology; Retrieved from the Birds of North America Online. Accessed 23/07/2013. Northern flicker (Colaptes auratus). ARKive.org, Accessed 23/07/2013.